Our most basic comfort food is now becoming the latest fast food trend: breakfast cereal. 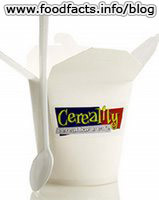 The 'cereal as fast food' concept started three years ago on the campus of Arizona State with the Cereality Cereal Bar and cafe. The idea is simple: offer a wide variety of breakfast cereals, toppings, and milk in a to-go container. It's simply an astute commercialization of what you can see during any major city's morning commute; people eating their breakfast cereal out of a tupperware-type container while they sit in traffic or on public transport. Cereality, started at ASU, now has 3 locations. 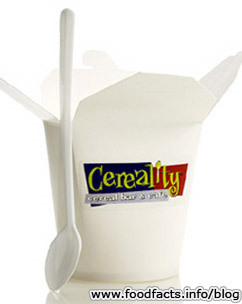 They offer 33 cereals and 34 toppings served in a "milk-tight container" that looks like a Chinese take-out carton. It's served by cereologists in pajamas. Cartoons, of course, are shown on flat-screens and milk is dispensed from the Moo Machine. A second chain based in Ohio, Cerealicious Cafes, will open locations in Columbus and Cleveland next month. I live in Arizona and had never heard of this place. I guess I will need to check it out. Thanks for the heads up.